Florence is known to most as the ‘Cradle of the Renaissance’, the city of where some of the most prominent artists of their time grew up and the city in which the Renaissance movement really found it’s feet. Visitors come from all over the world to take a look at Michelangelo’s ‘David’ statue, to browse the halls of the Accademia and marvel at the works within the Uffizi Gallery. Among the city’s most beloved landmarks is the Florence Duomo, with its unique exterior and towering cupola. You can discover all the highlights of Florence with a variety of guided or self-guided tours and skip the line entrance tickets. Aside from museums, galleries and cathedrals, Florence is also famous for it’s high end shopping, fine wines and delicious cuisine, there’s a little bit of something for every visitor. Active sightseers might like to join a city bike tour, while motorists can ride away on a vintage Vespa or join a convoy of Fiat 500’s to explore the Tuscan hills. 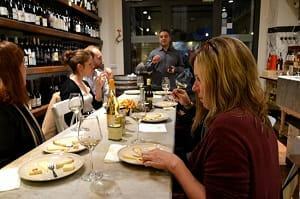 Foodies can take part in cheese and wine tasting sessions either within the city or in authentic Chianti Vineyards. 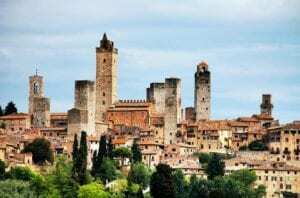 There are excellent Hop-On Hop-Off city bus services just waiting to guide you through this wonderful Italian gem, meanwhile, reputable tour companies can take you away from the city to the beautiful Cinque Terre National Park, into the heart of Tuscany’s wine regions or to medieval towns like San Gimignano, Siena and Pisa. A full day excursion from the heart of Florence to the heart of the Tuscan countryside. A taste of rural Italian life and an insight into the regions history. Visit an authentic winery in the Tuscan province. Sample homemade wines and local cheese. Visit medieval towns and picturesque villages. Visit it museum in Contrada. Reviews say that this is a comprehensive and worth wile day trip from Florence. The tour has very high rating on TripAdvisor as well as positive reviews from Get Your Guide and Viator users. Travellers have said that this is a delightful tour. If you like food, wine, historic towns and fine views then this tour is right for you. Enjoyable for children as well as adults, this is a fun and sociable day tour. 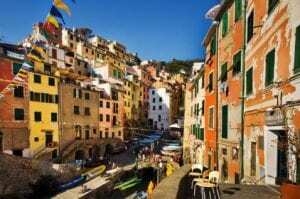 A convenient option for visiting the fantastic villages of Cinque Terre National Park in one day. An opportunity to explore divine scenery of one of Italy's national parks. Travel from central Florence to the outskirts of Cinque Terre. Cruise between fisherman's villages by small boat or local train. Learn about the park from an English-speaking guide. Fantastic if you only have one day to visit this beautiful national park. Travellers say that the tour packs a lot into a short space of time but comments agree that the trip is well organised and with great guides. Right for nature and outdoors lovers, as well as photographers or people who love seaside villages and pristine beaches. Suitable for families, groups or solo travellers. A chance to visit one of Florence's best attractions without wasting time waiting in line. A comprehensive guided city tour. Tour the city centre of Florence with an expert local guide. See the major attractions of the city and learn their history. Take a guided tour of the Uffizi Gallery. Travellers have described this tour as ‘interesting and ‘very informative'. Reviews frequently talk about knowledgeable tour guides. This combines sightseeing tour is very highly rated on TripAdvisor. Right for people who have an interest in sightseeing, art, and history. Suitable for small groups of individuals. A half-day sightseeing trip from Central Florence. An opportunity to try some homemade wines whilst enjoying the quiet countryside. A comfortable city excursion but comfortable air-conditioned coach. Tour the Tuscan country side and make stops at two separate wineries’ in the Chianti region. Tour the wineries and see the fermentation process. This tour has great recommendations on Trip Advisor. Travellers say that it is an excellent tour, ‘fun, informative, and enjoyable’. If you enjoy sightseeing and wine tasting then this is the tour for you. This tour is family friendly. An opportunity to explore the ‘Cradle of the Renaissance' on your own tailor-made itinerary. A flexible bus pass for exploring the city. Tour the city at your own speed. Get access to free onboard Wi-Fi. 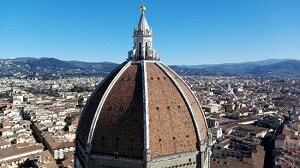 Learn about the Florence from a multi-lingual audio guide. 24 or 48-hour bus ticket. Travellers say that this is a convenient and very easy way to get around the city. 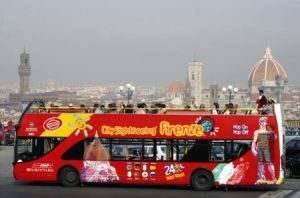 The Hop-on Hop-Off sightseeing buses are highly recommended in Florence. This pass is aimed at independent travellers who want to visit the city without restrictive timetables. A comprehensive guided tour of the Uffizi Gallery. A time saving skip the line entrance ticket. Browse the exhibitions of historic mediaeval art and renaissance paintings. Learn about major art movements from your gallery guide. Start to understand the significance of art in Florentine history. Comments say that this is a fantastic museum and defiantly worth a visit. Travellers also say that the enthusiastic tour guides really enhance the experience. 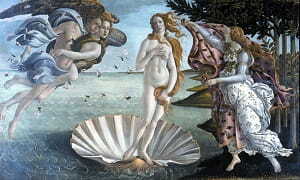 The Uffizi Gallery of one of the most popular attraction in Florence and has excellent reviews. If you know all about Florentine artists or want to learn about then, then this tour right for you. This tour and ticket gets you access to all parts of Brunelleschi's masterpiece. An opportunity to learn about the cathedral and it's construction from a art historian guide. A chance to admire religious art work and city views. Take a tour of the interior of Florence's grand Duomo. Take a look at the intricate architecture and marvel at stain glass windows. Climb to the Cupola for stunning city views. 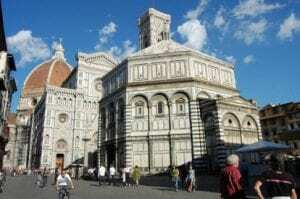 Travellers will tell you that this Florence tour is great value for what you get. Skip the line entry is defiantly useful during the busy seasons. This tour has 5-star reviews from TripAdvisor users. Right for people who are interested in history, art, architecture, and religion. Perfect if you are on a short weekend in Florence. A convenient fast-track entry ticket to the best gallery in Florence. A chance to see medieval artefacts and renaissance artworks in the former home of the Medici family. Pick up your ticket and breeze to the front of the entrance line. Spend an unlimited time admiring the many artworks and exhibits inside the Uffizi Gallery. Choose your preferred entrance time. Travellers say that there is so mush to see inside the Uffizi Gallery. Comments say that the skip the line tickets work well, they are very simple to collect and use. Right for people who prefer a self-guided tour. Good for people in city breaks, this ticket will save you time. A chance to see one of the most revered works of Michelangelo. A convenient and compact guided tour of the Accademia Gallery. Go directly to the front of the line at the Accademia Gallery. Take a 60-minute guided tour of the exhibits. See the iconic ‘David' statue with your own eyes. Travellers say that they has quick access to the museum and a very informative guide. The tour has a 4 out of 5-star rating on TripAdvisor and many positive comments. For art students and history lovers a visit to Accademia Gallery is perfect for you. Suitable for people with limited time and for all ages. A chance to put your cooking skills to the test and learn how some of your favourite Italian classics are made. A fun and sociable day trip from Florence. Take a trip around Florence marketplace to pick up fresh ingredients. Drive to a house in the countryside. Learn to cook and prepare 4 delicious dishes. This day tour has flying 5-star reviews from TripAdvisor and Viator users. The majority of travellers would highly recommend the experience. Comments agree that the farm house is in a lovely location and the guides are very friendly. 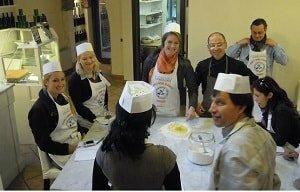 If you enjoy cooking and especially if you enjoy eating Italian food then this tour is right for you. This trip is suitable for all ages. A fun and sociable tour of Florence which focusing on foods and wines of the province. A chance to taste Tuscan specialties and local products. Join a small group tour and take your seat in a local wine bar. Chat with your guide and fellow travellers as you learn about Italian food and wine culture. Taste delicious wines and sample typical Tuscan foods. Travellers say that this is a very pleasant experience, especially after a busy day sightseeing. Comments agree that the tour is very relaxed and sociable. This trip has 5-star reviews on Get Your Guide. If this is you first visit to Italy, or you're a fan of Italian foods, then this tour is perfect for you. Best for adults but accompanied children are also welcome. 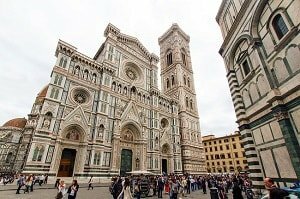 A fun and unique day tour from Florence. A chance to get behind the wheel of a classic car. An opportunity to travel in style through the Tuscan countryside. 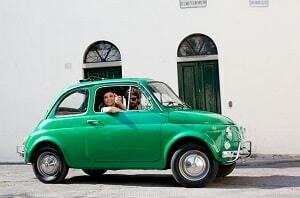 Cruise the quiet Tuscan roads in a vintage Fiat 500. Share a car with your friends and family. Drive trough rural villages and historic towns. Enjoy lunch and wine tasting as a Tuscan Farmhouse. Travellers say that this is the ‘best tour we took in Italy' and ‘one of our favourite outings'. The tour has very high customer feedback on TripAdvisor and 5-star reviews on Viator. If you enjoy driving, sightseeing and tasting local foods then this is the right tour for you. On this tour you will have the security of being part of a Fiat convoy and the independence of driving your own vehicle. 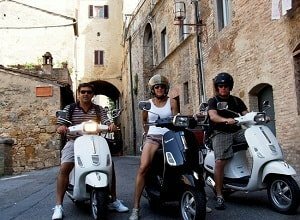 A half-day tour from Florence which takes you into the heart of the Chianti region on a classic scooter. A chance to cruise through rural Italy and combine sightseeing with wine tasting. Roam the Tuscan hills on a vintage Vespa scooter. Travel in a convoy led by your friendly local guide. 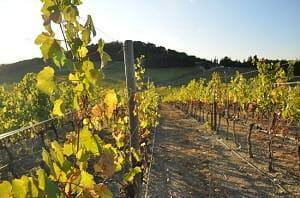 Visit a Tuscan vineyard and taste some delicious wines. The Vintage Vespa tour has excellent 5-star reviews from travellers who use TripAdvisor and Viator. Overall the excursion is very highly rated. Travellers recommend their tour guides and say that the trip is very fun. If the average bus tour sends you to sleep then this is fast-paced alternative for exploring the countryside around Florence. 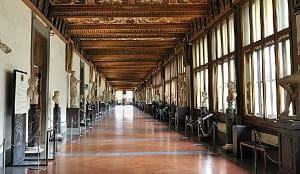 A chance to take a private or small group tour of the Uffizi Gallery. A time saving ticket and an excellent gallery tour. Browse the rows of incredible artworks. See a range of medieval displays and 16th century works. Learn about the work and lives of renowned Italian artists. Travellers love the small groups size. They say that the tour is perfect for getting to know the exhibits of the Uffizi Gallery. Comments frequently say that the gallery tour guides are very knowledgeable and friendly. For people who want to save time by skipping the entrance queue. Aimed at art enthusiasts who would value a private tour. A chance to dip into Tuscan culture and learn about the history of this province. A comprehensive combination of sightseeing, discovering culture and tasting local foods. Discover the stunning Tuscan countryside but comfortable coach. 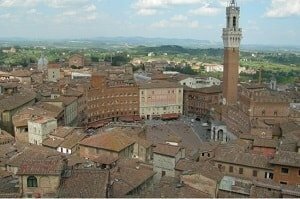 Visit mediaeval towns and tour the streets of Siena. Visit a vineyard and taste locally produced wines. 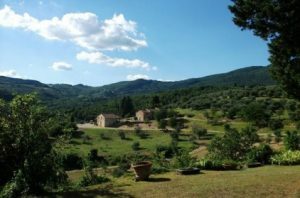 Travellers have a very high opinion of the Tuscany in One Day Tour. Certain travellers have written that this trip was the highlight of their holiday. 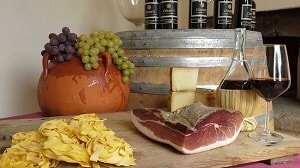 If you're a wine lover and enjoy tasting traditional foods, or if you want to see the highlights of the Tuscan province then this tour is right for you. The Leaning Tower of Pisa is one of the most iconic constructions in all of Italy. The wonky bell tower is the dominant feature of this tiny Tuscan city and the highlight of a trip to Pisa. This tour gives you the opportunity to explore the city and climb the tower. Travel from one Tuscan city to another. Pose for fun holiday snaps under the Leaning Tower. 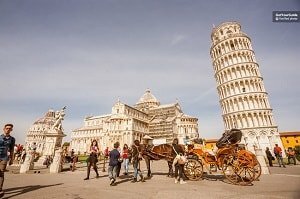 Take a guided tour of Pisa and visit cathedral. Climb to the top of the Leaning Tower on Pisa. Skip the line to the Cathedral and Leaning Tower. Generally travellers have very good things to say about this tour. It has very high ratings on TripAdvisor and Get Your Guide. Certain reviews point out that the tour feels rushed but the majority of customers would take this tour again. Ideal for travellers with a head for heights. This will appeal to people who have an interest in art and architecture. Tuscany produces some of the finest and most delicious red and white wines in all of Italy. The region is also has fantastic scenery and medieval towns. Take advantage of the opportunity to taste Chianti wines accompanied by olive oil, home baked bread and cold cuts. Enjoy a typical Tuscan lunch in a local restaurant. Lunch in local restaurant and wine tastings ate Tuscan vineyards. There are very high reviews for this tour, particularly on TripAdvisor where the average score is 5 out of 5. The full-day tour has been described as ‘amazing' and ‘the highlight' of a trip to Florence. The tour is ideal for anyone looking to discover the Italian countryside. Italy is known for it's delicious foods and Tuscany is particularly proud of it's fine wines. This is an opportunity to learn a few Italian cooking tips in a sociable cooking class. Pick up your ingredients and enjoy a few free samples in Florence's market place. Learn to cook a four course Italian dinner. Enjoy lunch and local wines with your fellow chefs. Cooking class with all ingredients. The Florence cooking class has very positive reviews from previous participants. Certain travellers say that they particularly enjoy the market you while other enjoyed making and tasting their own food. If you have an interest in Italian food and enjoy cooking then this tout is right for you. Florence is a city best explored by bike. With wide pedestrianized areas and charming parks which you'll get to enjoy during a 2.5-hour cycling tour. Tour the city centre an a vintage style bicycle. Learn about the city from a expert guide. Enjoy the leisurely pace and beautiful sights. Travellers reviews confirm that this sightseeing tour operated in both rain and shine, so be prepared. 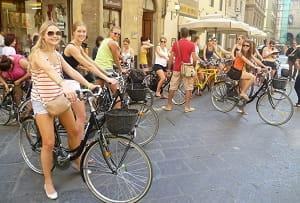 The Florence Bike Tour is highly recommended and customers indicate that its is a very fun tour and a good introduction to the city. Looking for an alternative to a slow moving walking tour? This tour is the one for you. This is a chance to see two of the best Florence attractions in a compact 3-hour tour. The city of Florence is known for being the birthplace of the Renaissance, so naturally, the city is rich in art, history and culture. Get to know central Florence with an expert local guide. Visit the Duomo and see Michelangelo's ‘David' statue. See the highlight of the city in just 3-hours. This is tour has very good reviews on TripAdvisor. One thing which is frequently commented on are the knowledgeable tour guides and the convenience of the skip the line tickets. For those with an interest in art, architecture, religion, history and sightseeing or for people with a short time in the city. A chance to get inside of one of the city’s oldest buildings. 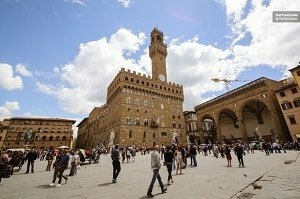 Save time with priority skip the line entry to the Palazzo Vecchio. Take a self-guided multimedia tour of the historic building. Learn about the rich and powerful Medici Family and their former residence. Discover the history of the Florence’s former civic power house and view magnificent artworks painted by revered Italian artists. Pay and optional visit to Arnulfo’s Tower for fantastic city views. Entrance ticket to the Palazzo Vecchio. The Palazzo Vecchio has excellent reviews on Trip Advisor form people who have recently visited the attraction. Reviews often say that this ‘amazing place’ is ‘not to be missed’. Comments generally agree that this museum is a wonderful way to step back in time and discover medieval Florence. Right for history and architect lovers. A great introduction to the history of the Medici family. A time saving and convenient combo tour of the Uffizi Gallery and Florence Academia Gallery. The Uffizi Gallery hosts one of the worlds best collections of Renaissance art by some of Italy’s greatest artists. 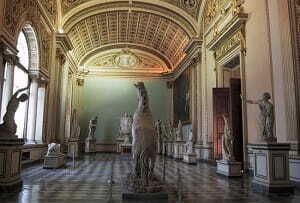 The Academia Gallery is best known as the host of Michelangelo’s perfectly carved David statue. Skip the line and choose between a guided of self-guided tour two of Florence’s best art galleries. See the works of revered renaissance painters, including Da Vinci, Botticelli, Giotto and Raffaello. Entrance fees to the Uffizi and Academia Galleries. Fast track entrance to the Uffizi and Academia Galleries. Guided tour or multilingual audio guide (depending on selection. Travellers and art lovers rave about these two famous galleries. 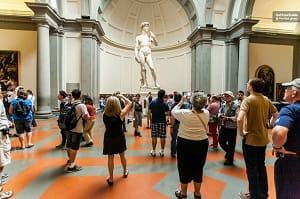 Most people who have participated in the Florence galleries combo tour would highly recommend the experience. Visitors would agree that skip the line entrance is worth while even if you do not want a guided tour. These galleries are must-sees for art and history enthusiasts. The combo tour is ideal for city breaks and people who want to make the most of their time in Florence.